Public interest in fermented products is really bubbling! And, with good reason… traditionally lacto- fermented foods are rich in probiotics and digestive enzymes which keep our guts healthy. The process of lacto fermentation actually increases the amount of vitamins, ,enzymes and beneficial bacteria already present in most foods! It also creates new and exciting flavors that keep your meals interesting! If you’re serious about boosting your immunity and staying healthy, adding fermented foods to your diet is critical! Imagine creating healthful condiments your kids will love- ketchup, mustard, salsas! Join me for this hands on class as we explore different cultures and recreate these life supporting foods! 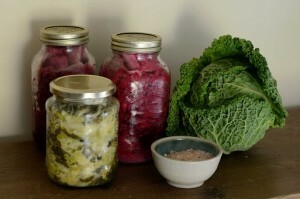 We will be making various vegetable ferments (sauerkraut, kimchi, salsa!) And, at the end of our fermenting, we will sit down to a fest that includes a smorgasbord of international fermented foods! You will be taking home what you make! Mason jars will be provided at the class. Please join us in discovering the fun and fascination of fermentation! Register here. Location will be sent up on registration.